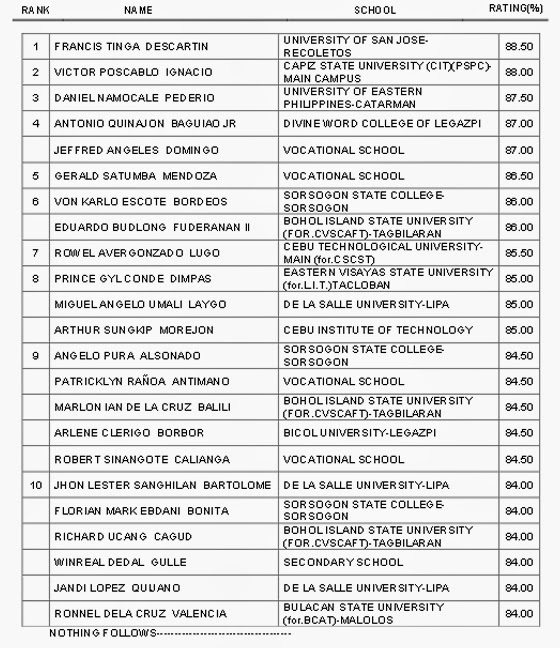 Registered Master Electricians April 2015 Board Exam Results (List of Passers, Topnotchers) - Balita Boss! The Professional Regulation Commission (PRC) released the April 2015 Registered Master Electricians Licensure Examination results. The official results were released on Thursday, April 30, 2015. The examination was conducted by the PRC on April 26-27, 2015 in the cities of Manila, Baguio, Cagayan de Oro, Cebu, Davao, Iloilo, Legazpi and Lucena. A total of 1,134 out of 2,705 examinees passed the April 2015 Registered Master Electricians Board Exam, according to PRC (via PRC Website). UNIVERSITY OF SAN JOSE-RECOLETOS graduate FRANCIS TINGA DESCARTIN topped the April 2015 Registered Master Electricians Board Exam with a passing rate of 88.50 percent. DE LA SALLE UNIVERSITY-LIPA emerged as the top performing school in the April 2015 Registered Master Electricians Licensure Examination as per Commission Resolution No. 2010-547 series of 2010, with 83.54 passing percentage or 66 out of 79 passed the exams. View or download the performance of schools in the April 2015 Registered Master Electricians Licensure Examination at prc.gov.ph. The Board of Electrical Engineering who administered the April 2015 Registered Master Electricians Board Exam were Engr. Francis V. Mapile as Officer-In-Charge, with Engr. Jaime V. Mendoza as members. Registration for the issuance of Professional Identification Card (ID) and Certificate of Registration will be on May 11, 2015. The date and venue for the oathtaking ceremony of the new successful examinees in the April 2015 Registered Master Electricians Licensure Examination will be announced later, the PRC said. Thank you for reading. Please follow Balita Boss? on Facebook, on Twitter or on Google+ to receive updated information about the Registered Master Electricians Licensure Examination.